Thank you for your interest in California Spray Millet® brand and California Golden Spray Millet® brand. Terry Schroeder started raising spray millet over twenty years ago because there was a need for a quality product. He has a family farm that has been growing California Spray Millet® brand from the beginning. In 2008, Paul Underhill and Paul Holmes purchased Goldenfarm Products, and with Terry's guidance are now selling California Spray Millet®. Golden Farm Products® has been in the business of growing and distributing California Spray Millet brand® and California Golden Spray Millet® brand birdseed products for over 20 years. Our products are grown on fertile mineral rich soil that yields a healthy, plump, and sweet smelling product. Our Premium Spray Millet® is handpicked, sun-dried, packaged and stored on our farm to ensure you receive only the highest quality spray millet available. Our policy is to consistently produce superior quality birdseed products that your birds will love and thrive on. To be sure you receive only the finest spray millet ask for the California Spray Millet® brand and California Golden Spray Millet® brand by name. 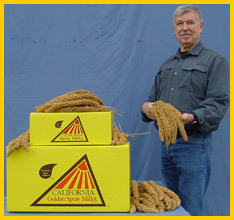 Would you like to become a Distributor or Dealer of California Golden Spray Millet?